Please Note: The images used here are taken from the standard-definition DVD version of Blancanieves also included, not the Blu-ray edition under review. 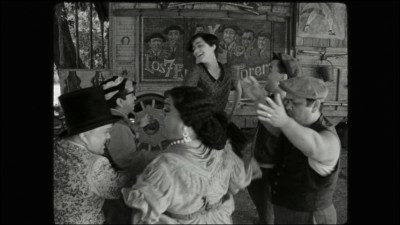 Pablo Berger's Blancanieves is a pastiche of selectively recruited silent-film stylings that, like its inevitable comparison-point The Artist (a film that beat it to the punch even though Berger's was already well into production when its buzz began to spread), fails to take that part of its conceit very far, certainly nowhere innovative or earth-shattering. It is, however, more solid, less winking and showy (and sometimes near-parodic, superior) than The Artist, and more straightforward and relaxed in its fairly arbitrarily chosen big-screen storytelling mode. I say "arbitrarily" because, unlike The Artist, Berger's story -- an update of the Brothers Grimm's "Snow White" to Spain in the 1920s, i.e., the silent era -- is more durable, less formally conceived and locked in as A Neo-Silent Movie, and could probably just as effectively have been delivered dressed in some other movie era's trappings -- a film noir "Snow White," a Technicolor-melodrama "Snow White"; it could definitely work. 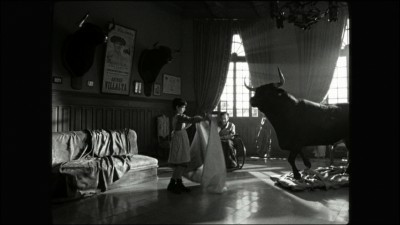 But it's a square-not-rectangularly-framed, black-and-white, intertitled, and impeccably period-detailed pre-sound look and feel that Berger has hit upon for his rendition, and though this maneuver doesn't lead him to anything especially fresh or unique, he does make the style and the story fit each other nice and comfortably. In the Grimm Brothers according to Berger, Snow White is the unfortunate daughter, here called Carmen (and played as a child by Sofia Oria, as a young woman by Macarena Garcia), of a flamenco-singing star recording artist (Inma Cuesta) who dies giving birth to her and a famous, beloved bullfighter (Daniel Gimenez Cacho, the priest in Bad Education) permanently injured in a fight gone wrong and ensnared as a sudden widower by a crafty nurse (Maribel Verdu, the luminous frequent collaborator of Guillermo del Toro and star of Y Tu Mama Tambien) who smells his money and soon becomes Carmen's wicked stepmother and nemesis. As soon as her husband dies during her stepdaughter's late adolescence, this aspiring evil queen plots to murder the ravishing, free-spirited, prettier younger woman. But we've seen that the balletic skill of the bullfighter has been passed down, both through blood and instruction, to Carmen by her now-departed father, and when her stepmother's failed attempt on her life leaves her alive but amnestic, rescued by a touring troupe of bullfighting dwarves (the handsome lead among whom, played by Jinson Anazco, falls in love with Carmen) she manifests the beauty and star power of both her mother and her father by becoming the lead attraction in the dwarves' show and Spain's bullfighting heroine. Her wealthy-widow, fame-seeking, jealous stepmother, upon reading about her reinvented, widely admired stepdaughter in a celebrity magazine, has the inevitable rage and cruel inspiration for which the character is best known, arriving to Carmen's biggest, best-attended bullfight ever with the congratulatory gift of a suspiciously tempting apple. We all know the story, so Berger's film's success really depends on how well the silent-film/period technique draws us to the familiar tale and brings out its perennially alluring fascinations. On this front, Berger, while not getting at anything too meaningful or different in his retelling (in Spanish cinema, Pan's Labyrinth remains the "fairy-tale" film of recent times that resonates with insights into that nation's people and history, and Victor Erice's Spirit of the Beehive, not to mention uber-cinephile Pedro Almodovar's films, are superior as tributes to the important properties and powers of the silver screen), gives us enough pretty pictures and little fillips of whirlwind montage approximating that of the ground-breaking romantic films of the visually innovative silent era (from Coeur Fidèle to Sunrise to Lonesome) that, despite its never adding up to much more than an unusually ornate, perhaps too-faithful version of a story everyone knows almost subconsciously, it's rarely anything less than a pleasure to look at. That's not due to what you could properly call the film's audacity or "authenticity," however. 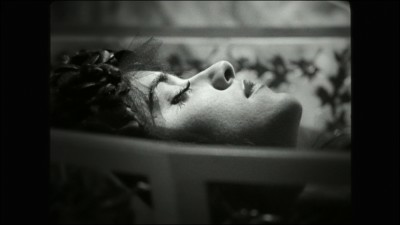 Many of the '20s-specific details of set, costume, and prop are painstakingly true and eye-catching indeed, but virtually everything coded "silent movie" about it -- the cinematography by Kiko de la Rica (despite the lovely, old-fashioned grain/texture of the black-and-white, including instances of carefully placed stray eyelashes/hairs stuck at the edge of the frame, as can often be seen in older films); Fernando Franco's editing -- have been done before, and bolder, in sound (and sometimes color) films by Fellini (8-1/2) and Truffaut (The Wild Child) and Nic Roeg (Don't Look Now) and many others, and it's as much to that free-borrowing lens of later cinephilia as to the original source of actual silents that Blancanieves owes its tasteful, fluent, but still somehow recognizably contemporary sensibility (for something of recent vintage that more timelessly, eerily feels like a "real" silent film, see Guy Maddin's Brand Upon the Brain! or the second section of Miguel Gomes's superb Tabu). This ornateness makes Blancanieves more simply enjoyable as an uncomplicated, well-told story than impressive or trenchant, but that's okay. It doesn't burden itself with the air of anything more than a mild-mannered, modest (if elegant) entertainment, and on those forgiving terms, it has enough more than its share of skill, cleverness, charm, and beauty (however skin deep) to make it a great candidate for the next evening you're in an escapist mood or need a picture that offers interest and pleasure to every member, young or old, of the family. 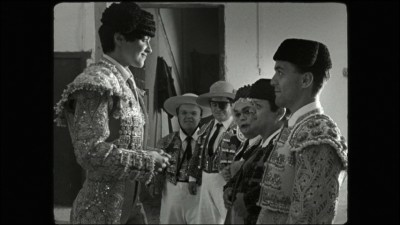 This transfer of Blancanieves, preserving the film's original aspect ratio of 1.33:1 (which is also the correct silent-era-approximation AR), looks absolutely lovely; the rich contrasts of Kiko de la Rica's black-and-white cinematography are rendered with supreme fidelity, very solid and vivid, with no aliasing or edge enhancement/haloing whatsoever, and a very healthy retention of celluloid-like texture and grain (i.e.., nobody went anywhere near overboard with digital clean-up/digital noise reduction) keeping the whole thing looking as beautifully cinematic as it was intended. A very fine, eminently conscientious and respectful transfer job. The film's soundtrack (which, obviously, is just the score Alfonso de Vilallonga and intermittent sound effects, no dialogue for a "silent" film) is presented as a DTS-HD Master Audio 5.1 track and is splendidly clear, full, immediate, and resonant, filling up the speakers with sublimely rich, undistorted, perfectly balanced sound, like a symphony orchestra playing the score in your home movie-watching space. 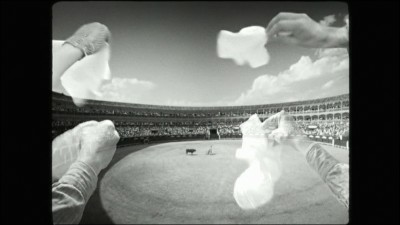 Following the film's release format, intertitles are presented in English, not the original Spanish. --A 30-minute behind-the-scenes featurette running the gamut of the process of making Blancanieves, including interviews with Berger and members of the crew and the cast; footage from various shooting days; and glimpses of screen tests and the postproduction process. --A director's introduction (2 min.) that incorporates Berger's words about the film with some flashes of behind-the-scenes and post-production footage; really more of an advertisement/enticement than a proper "introduction." --"Preparing the Shoot" (5 min. ), a compilation of footage with Berger in his office as he puts the final touches on his script and on-location setups/preparations of scenes, with a mix of candid footage of the director at work and speaking to the camera as he outlines his creative/shooting processes. --"Blancanieves: Live in Concert in Barcelona and Madrid" (4 min. ), really just footage from the film's red-carpet premieres in those two cities, with brief snippets of introductions of the cast, presentations by the filmmaker/actors from the stage, and the live orchestration that accompanied those screenings. --The film's U.S. theatrical trailer. --A glossy collectible booklet insert, very elegantly designed, featuring director's statements/quotes, brief text offering good literary and cinematic context for the film's story and style, and very nicely reproduced photos from the film. --A free download of the film's soundtrack (via an included card with a printed download code). --The DVD version of the film is also included in this dual-format edition. A Spanish retelling of the Brothers Grimm's "Snow White," Pablo Berger's Blancanieves is bound to annoy purists of at least a couple of stripes. There will always be those for whom Disney's 1937 animated version is definitive and exclusive; and by borrowing all of the trappings -- black and white, Academy ratio, intertitles -- of the silent film more as well-done decoration than some committed or meaningful stylistic choice, Berger will surely earn the ire of cinephiles closely familiar with the great, inimitable work of the silent era. But without overburdening it with challenges to which it doesn't lay claim, we can see and enjoy Blancanieves for what it is -- a lark that takes and provides plenty of pleasure in its fairly clever, often quite tender and beautiful take on a well-known, simple but resonant tale. Something more innovative and incisive conceivably could've been done with the idea, but if the film only stretches itself to being a pretty, reasonably intelligent and skilled diversion, it at least does that with a consistently enjoyable flair. It's a mild-mannered, modest, but true pleasure, a film that might not stick so permanently in the mind but could probably be thoroughly enjoyed by just about anybody at just about any time. Recommended.